When I first saw Lady Bird back in October during the London Film Festival, it was very literally a surprise; it was shown as the Festival’s annual “Surprise Film” which was not revealed until the film actually began, so I as well as the rest of the audience were very excited to see what had back then been labelled as an unmissable movie during this awards season, and it’s fair to say that everyone, including me, was very satisfied with the results. It’s also extraordinary to see it thrive in the way it has done, not just with critics but with awards pundits and audiences in general, as to date it has grossed nearly $50 million in the US alone against a budget of $10 million, been at the very least mentioned at most of the major awards shows this year, including five major Oscar nominations to its name, and for a short while even rode the wave of dethroning Toy Story 2 as being the most-reviewed film on Rotten Tomatoes to retain a perfect 100% score after 164 positive reviews (however, a negative review soon pushed it down to 99% which it is still at as of this review, and Lady Bird has since been dethroned by Paddington 2 which is still at the very top after 187 reviews). 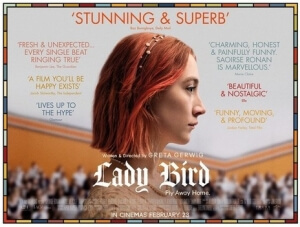 Needless to say, Greta Gerwig’s solo directorial debut has really caught on with people, and now that some time has passed from the first time I was able to see it, I can say that Lady Bird is still just as exhilarating and even surprising as I remember it being, although my original opinions on some of the things I criticised before have certainly changed. The plot, in case you don’t remember from last time, is about teenager Christine (Saoirse Ronan) who calls herself “Lady Bird” and insists that everyone does so as well, and who navigates her final senior year at a Catholic high school, before attending college. There, she gets into all sorts of escapades with her best friend Julie (Beanie Feldstein), lusts after boys like nice and handsome Danny (Lucas Hedges) and pretentious musician Kyle (Timothée Chalamet), and tries breaking into the realm of the more popular kids. Crucially, however, she frequently clashes with her mother Marion (Laurie Metcalf), who is similar to her in almost every way but has a harder time keeping her family afloat, especially when her husband Larry (Tracy Letts) loses his job and suffers from depression. Lady Bird and Marion are simultaneously at each other’s throats, but also deeply care for one another at the same time, and the biggest chunk of its heart centres around their troubled relationship. Gerwig deserves all the credit and awards recognition that has come her way over the past few months, as with this film she has introduced herself to the world as a fresh and vivid voice in cinema that is as authentic as it is sorely needed right now. Her script is filled with wonderful dialogue that can be funny as well as sincere and touching, mixing satirical overtones – for example, a scene that sees the high school football coach trying to stage a production of The Tempest goes exactly as well as you’d think it would – with moments of genuine emotion that feel natural and entirely earned. As a director, she balances tone extraordinarily well and makes each character seem like a real person that you’re watching on the big screen, through the fantastic performances she gets out of her ensemble, including Ronan who has never been a funnier and more emotionally resonant presence, and especially Metcalf who in lesser hands could have portrayed a real horror show of a mother, always criticising to a point where it would almost become verbal abuse, but she really makes this character a fascinating and surprisingly warm presence. It is with Metcalf’s character that I initially had one or two problems with when I first saw this movie; back then, I seem to remember thinking that her passive-aggressive and snarky attitude didn’t exactly make her the most sympathetic character, especially when towards the end something happens that leads to her virtually ignoring her child, which I wasn’t very happy with personally. A second viewing, however, does open up a bit more for me to understand where she is coming from; she is a woman who admits during the film that her own mother was an abusive alcoholic, so doesn’t exactly have the best understanding of proper motherhood when bringing up her teenage daughter, who is going through phase after phase and yearning for independence from her Sacramento hometown. That, coupled with the added pressure of providing as much as she can for her family, causes her own insecurities to come out in the open whenever she clashes with Lady Bird, and suddenly having that understanding about the character made me realise that she’s a much more tragic figure than the first viewing let on, indeed a sympathetic one. Again, Metcalf is so good at bringing this character to life, and even though Allison Janney is all but guaranteed to take home the Best Supporting Actress Oscar for I, Tonya (though don’t get me wrong, she’s great in that movie and it would be a fair win), I would personally champion Metcalf for the win for what I felt to me a much more layered and interesting character. This is a movie that definitely has more adult themes and approaches than any other teen movie in the last few years, even some of the better ones like The Edge of Seventeen, so definitely check it out whenever you possibly can, especially when repeat viewings can potentially make it even better like it has done for me. Lady Bird is a resounding success for writer-director Greta Gerwig who brings the humour and warm heart of its story to the foreground with a tight script, solid direction, and excellent performances from Saoirse Ronan and Laurie Metcalf.